Based on our unique and proprietary “VIPs” and polymer synthesis technologies, currently we are developing and manufacturing three categories of DNA/siRNA transfection reagents, which show distinct transfection characteristics compared with the leading products in the market. What's more important is that the transfection reagents we are manufacturing are very affordable and will save your precious research budget. Based on our proprietary polymer synthesis technology, ExcelDNAfect Transfection Reagent is formulated as a biodegradable polymer based DNA transfection reagent that ensures effective and reproducible transfection on HEK293, COS-7, NIH-3T3, HeLa, CHO and a broad ranges of hard-to-transfect mammalian cells. ExcelDNAfect reagent is able to immobilize DNA migration during electrophoresis at very low concentration and form transfection complex within 5 minutes at RT. 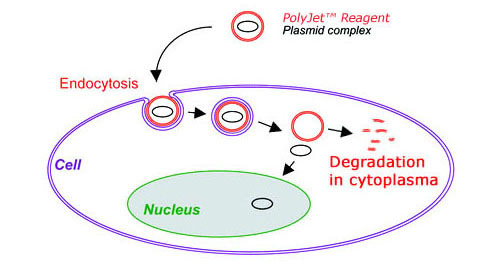 A remarkable feature of the reagent is the rapid and complete degradation of polymer after transfection complex endocytosis (Figure 1), leading to much less cytotoxicity. PolyJet™ reagent, 1.0 ml, is sufficient for ~667 transfections in 24 well plates or ~333 transfections in 6 well plates, providing a very affordable alternative to the leading products for transfecting a variety of commonly used and hard-to-transfect mammalian cells. PolyJet Transfection Reagent worked equally as well as lipofectamine 2000, with little evidence of cell death on 293, PC-3 and 22RV1 cells. I will defiantly consider switching over. I only did side by side with the testing sample (PolyJet) and Lipo2000 with GFP transfection on COS-7 cells. The result was very good. PolyJet was even better than L2K. I tested the sample of PolyJet on my NIH-3T3 mouse fibroblasts this weekend. The results were much better than Lipofecatmine LTX. I'm attaching a powerpoint slide with my results (I did not quantify the % transfection efficiency, but the pictures get the point across). I found that the protocol for difficult-to-transfect cell lines worked better than the standard protocol. I had chance to try your product finally. It was great success. I used HeLa cells and got 10% transfection efficiency (<0.1% for Lipofectamine). Thank you! I was wondering if I also try GenJet™ Plus DNA In Vitro Transfection Reagent? According to your website, the reagent works better than regular PolyJet. I tested PolyJet and it looks great on MDCK. We placed order. Thank you! We are happy to provide feedback. PolyJet worked very well for us in HepG2 cells, we got approximately 80% efficiency with pMAX GFP plasmid, by following the conditions in your suggested protocol. We ran a comparison with Lipofectamine, which only showed approximately 20-30% transfection efficiency. We are planning experiments and will be ordering more soon.